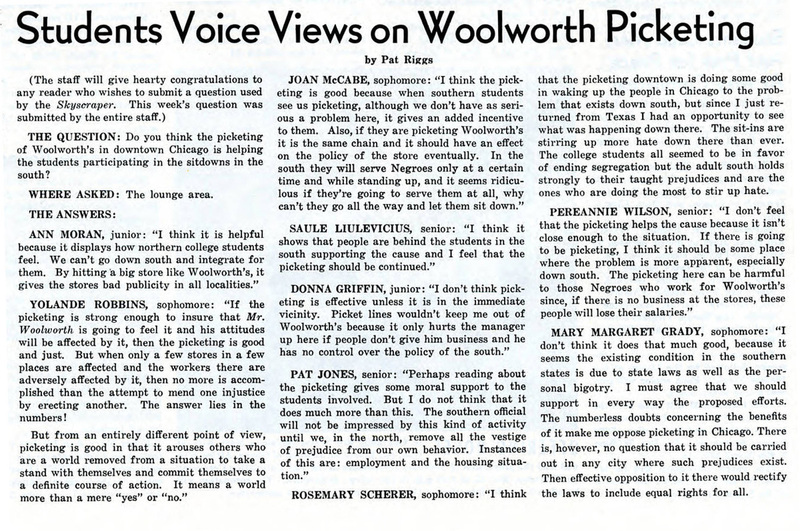 "Students Voice Views on Woolworth Picketing," Skyscraper, May 4, 1960. When four African-American students began a sit-in at a Woolworth’s store lunch counter in Greensboro, North Carolina in February 1960, they inspired a national following. Not only did the sit-in grow to include hundreds of activists, but similar demonstrations sprouted up in Woolworth stores across the United States. Chicago proved no exception with students organizing a picket of Woolworth’s downtown store. 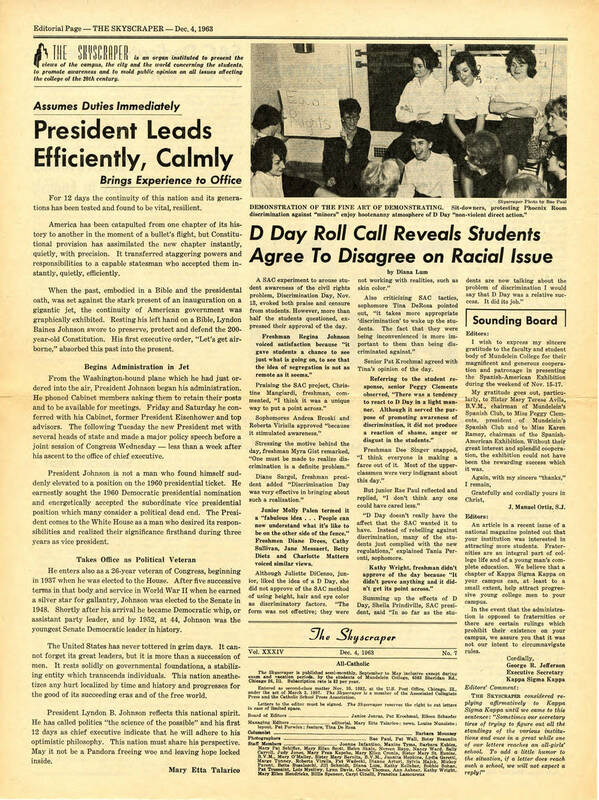 On May 4, 1960, Mundelein students weighed in on the nonviolent action and the issue of racial segregation in an issue of the Mundelein College student newspaper The Skyscraper. "D Day Roll Call Reveals Students Agree to Disagree on Racial Issues," Skyscraper, December 4, 1963. In an effort to raise awareness of the realities of racial segregation, the Student Activities Council held Discrimination Day, an event admitting students solely on the basis of “height, hair and eye color as discriminatory factors.” Taking again to the Mundelein College student newspaper The Skyscraper to share their opinions, Mundeleinites expressed unwavering support and strong disapproval of the demonstration, claiming the event made light of the lived experience of its students of color.